A pergola is also called an arbor. It is commonly built with a latticed roof supported by cross beams. It can be a simple narrow arch that leads to other parts of the lawn or garden. Or it can be a wider structure that spans the whole patio or outdoor kitchen. 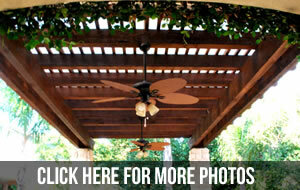 Large pergolas are often constructed using a combination of wood, concrete, and aluminum. But it can also be composed of only one of these materials as well. You can have an all-wood pergola, a concrete pergola, and an aluminum pergola. Pergolas can be custom-fitted with additional features such as lighting, curtains or drapes, outdoor furniture, and even a firepit. These additions make the pergola all the more versatile. With a pergola, a love seat and a small bookcase or basket of your favorite books, you can create a shady reading nook outside the house. Fairy lighting or small twinkly lines woven around the pergola pillars and dangling from the lattice roof creates a whimsical and romantic ambiance over a table for two. A pergola can be set up beside the swimming pool to serve as a mini bar or even as an outdoor shower. Our broader Woodlands pergolas can serve as cover over your outdoor dining area or outdoor kitchen. If you prefer a more enclosed structure for family gatherings Patio Creations can install a Woodlands gazebo on your lawn or backyard. Unlike the open feature of the pergola, gazebos are semi closed by its walls. Call Patio Creations today and set up a risk free consultation to learn what kind of pergola or canopy is most suited for your house.